Latest research (Apte et. al. 2015) shows across India, that as many as 4 Lakhs premature deaths per year could be prevented if the WHO AQG levels were met during the coming years. Deaths from air pollution would increase by 20-30% in India, if no action is taken to bring down the current air pollution level. Humans have a relatively good immunity against microbiological contamination (infectious or allergenic substances like bacteria, yeast, mould, fungi, virus and pollen or their toxins and by-products). But there is no “immunity” against particulates that we breathe in. Ultra-fine particulates (less than 2.5 µm) travel deep into alveoli and stays there starting to reduce the active surface area of lungs. Larger particles are of less concern, although they irritate eyes, nose & throat. More particulates we breath in, higher is the risk of reduced lung capacity, asthma, cardiovascular disease and cancer. Fine and especially ultra-fine particulates contains microscopic droplets that are so small that they can get deep into the lungs and cause serious health problems for humans. 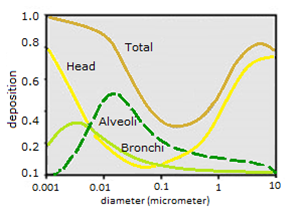 Scientific studies have linked particulate pollution exposure to a variety of problems, including premature death in people with heart or lung disease, non-fatal heart attacks, irregular heartbeat, aggravated asthma, decreased lung function, and increased respiratory symptoms, such as irritation of the airways, coughing or difficulty in breathing. WHO reasserted in 2013 that PM2.5 and ultra-fine particulate pollution are carcinogenic to humans and WHO Indoor Air Quality Guideline states that PM2.5 level of 35 µg/m3 is already associated with about the 15% higher long-term mortality risk. Other harmful air pollution are chemicals, like Ozone, Sulphur dioxide, Nitrogen dioxide, Lead and Ammonia. The annual average of PM2.5 level (WHO report 2015) in various Indian cities has been calculated as daily cigarette equivalence by assuming thet PM2.5 level of 22 μg/m3 is equivalent of one cigarette per day (Berkeley Earth). Continuous inhale of particulate matter creates permanent damages into our lungs.